Home Hunting MO’s Spring Turkey Hunting Regulations-Change needed? Monday, April 16th marks the start of my 13th season turkey hunting in the great state of Missouri. Upon preparation, I had some thoughts on existing season dates and regulations. April 16-May 6th; hunting stops at 1:00 pm CST with harvest limit of two male turkeys (only one can be taken during the first week from April 16-23rd. If you do not harvest one during the first week, you may harvest two turkeys during the second or third week, but they cannot be on the same day). The first three bullet points are Kansas, Nebraska, and Oklahoma’s 2018 spring turkey regulations, respectively. The last is Missouri’s. The complexity and stipulations put in place by the Missouri Department of Conservation (MDC) has puzzled hunters for years. Let me first say the MDC does a lot of things right, and is easily one of, if not the best, government-run agencies in the entire country. However, turkey season length, daily time limits, and weekly bag limits have concerned Missouri citizens. who have reached out directly to the Department. The Conservation Federation of Missouri has also raised concerns via resolutions. With a biology background, I get the arguments on a basic level. Turkey numbers have decreased over the last ten years. Limiting pressure MIGHT be key in preserving our turkey numbers. Let’s break it down. Many states in the Northeastern United States implemented this regulation, along with Missouri, in order to limit the disturbance by hunters during the season. Nesting hens tend to feed, drink and mill around in the afternoons in spring. That is mainly because the temperature is warm enough so the eggs do not have to constantly be incubated. Biologists believe a 1:00 pm stop time alleviates the chance of hens being poached, abandoning nests, and enduring other stress. However, the data collected is showing there really isn’t a significant impact one way or the other (via the Pennsylvania Game and Fish Commission). So why keep the 1:00 pm stop? I hunt Kansas and I can tell you hunting all day is an amazing perk. I would argue the chance of a hen abandoning her nest due to encountering a hunter is way less likely than a opossum, raccoon, or other predator decimating a clutch of eggs while she steps away for an afternoon feeding. I have hunted in Missouri since 2004 and I have NEVER understood the regulation restricting hunters to only one turkey during the first week. I have done some research on it, and I just cannot find a reasonable explanation other than “limiting hunting pressure.” To me, it is a moot point. For example, in 2011, Easter fell during the spring season. Because of this, hunters could hunt all weekend and then, if off Monday, hunt again. That is exactly what happened. Tyler and I both shot a bird on Easter Sunday and then another on Easter Monday, since it was during the second week. Granted, this is an outlier, but it illustrates how totally pointless the rule is. I understand it’s most likely to reduce pressure from weekend hunters on turkeys, and it correlates with the natural breeding cycle of the wild turkey, but the amount of pressure removed is not meaningful in most hunters’ eyes. If we limit bag limits and hunting time, an archery season should be implemented. Keep the 1:00 pm stop time, but allow two birds to be harvested throughout the duration of the season, regardless of the week or archery/shotgun. If a hunter wants to take two toms on opening day of archery, let he or she do so. Limiting based on weeks is not statistically important enough to keep enforcing, according to some studies. Other studies say differently, but neighboring states have thriving turkey populations and have much more lax laws. It very much is a 50-50 split, but changes must happen to allow more spring turkey hunting opportunities in Missouri. Making the season longer would help alleviate pressure more than the other options, I argue. Hunters, theoretically, are not forced to hunt during three weekends (for sake of argument, I am assuming most hunters are limited to weekends) but would have a much longer opportunity. I have no qualms with the two bird limit, but I disagree with limitations regarding when you can harvest those birds. The research I’ve done shows there is no definitive proof this regulation works. I think it has just become indoctrinated within the law, with nothing to push them in the other direction. To me, it is equal to the MDC taking away the second archery buck tag. On average, only 600 archery hunters statewide filled their second buck tag. So they took it away, but expanded youth hunting seasons which allow hunters 5 days with firearms to shoot a buck–without antler point restrictions. It’s counter-intuitive. I want to know what you think, though. I may be being selfish in my convictions, wanting to be able to hunt as much as possible, but I cannot be the only one questioning the puzzling regulations set by the MDC. As of February, I know they were considering making some updates. Let’s hope! 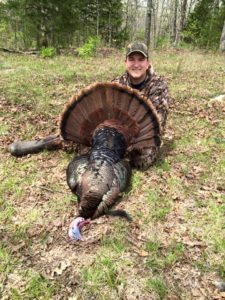 Mahoney Outdoors, Opening Day, Regulation Changes, Ryan Miloshewski, Turkey, Turkey Hunting, Turkey Season. Bookmark.